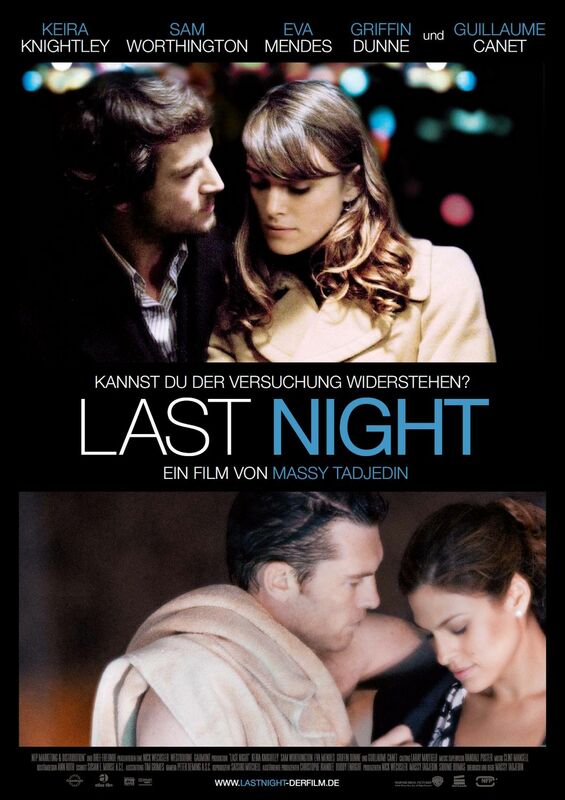 Directed by Iranian-American director, Massy Tadjedin, ‘Last Night’ is a romantic drama revolving around a posh married couple, Joanna and Michael Reed (Keira Knightley and Sam Worthington), who live in New York. After years of marriage, Joanna and Michael start to experience relationship tensions, doubts and stings of jealousy. Over the course of two particular days, these tensions build-up at which point Joanna attends Michael’s work party and finds out about Michael’s interest in his attractive work colleague Laura (Eva Mendes). However, the following day, when Michael goes on a business trip with Laura, Joanna meets her old flame, Alex (Guillaume Canet), and jumps on a date with him. As the Reeds start to succumb to their ever-increasing love temptations, the question becomes: who will cross the line? The film, which takes place over the course of two days, explores the well-familiar themes of marital fidelity, trust and forbidden extra-marital love affairs. However, what makes ‘Last Night’ stand out from the crowd is the way the film portrays the well-rehearsed melodramatic themes. The film is emotionally-charged and accentuates well the characters’ feelings and thoughts as they shift between reason, emotion and their natural inclinations. Although none of the characters in this film are presented well enough for the audience to truly care about their fates, the audience still feels and fully participates in the couple’s dilemma. On psychological level, ‘Last Night’ is also clever. Throughout the film, there are characters, for example Laura or Truman (a friend of Alex), who question Joanna and Michael’s feelings and motivations behind their actions, making the film almost like an interesting psychological case study. The on-screen chemistry between Knightley and Canet is great: they look good together, and become an absolute pleasure to watch. On the other hand, Worthington and Knightley’s on-screen chemistry leaves much to be desired, to the point of arousing a sense of curiosity as to how they even managed to become a husband and wife in the film in the first place. In that vein, had the chemistry between Worthington and Knightley been stronger, the film’s narrative and ending would have been more compelling and dramatic. The fact that the characters in the film are not-well “crafted” and “defined”, being sometimes akin to “lose cannons”, adds to the lack of excitement or intrigue in the film, making it sometimes tiresome to follow. Although some critics have pointed out the complex moral dilemma of the film (what is worse – Michael or Joanna’s actions? ), there is really hardly any. The problem lies with the sense that it is too easy to sympathise with the all-platonic, totally innocent and purely emotional attachment of Joanna to Alex, and criticise Michael as “the cheating husband”. It is clear that even though Joanna cheats “with her heart”, she still loves Michael dearly and is very loyal to him; while Michael is clearly too infatuated with Laura to truly care about Joanna and her feelings. Thus, it is clear that there is no competition of “who is the bad one here?” in this movie. This predictability of the unfolding situation is the downside. The other problem of ‘Last Night’ is its dialogue. Although there is an apparent effort to make the dialogue as “authentic” as possible, it is muffled or hardly audible at all. Sam Worthington’s screen presence and acting deserve a special mention. He gives not only a very “wooden”, “half-sleepy”, indifferent performance, his screen presence truly annoys most of the time, especially given the lively, vivid and powerful performances of his co-stars. Watching Worthington perform, it becomes increasing desirable to see anyone but Worthington in the role of Michael, who will undoubtedly bring more depth and suspense into the film, and give the character of Michael so much needed emotional and mental “depth”. Despite all these criticisms, as a director’s debut, the film fares very well. The film script is very interesting, and, as one film critic has pointed out, appears to be a cross between ‘Unfaithful’ (2002) and ‘Closer’ (2004). Although if compared to ‘Closer’, ‘Last Night’ seems undeveloped and too predictable, it still “wins” in places where ‘Closer’ does not even venture, for example, in portraying movingly the lingering moments of extreme intimacy. The ending in ‘Last Night’ is also very thought-provoking and touching, and the acting is also very good by three main leads: Knightley, Mendes and Canet, with Worthington being the weakest link. Moreover, the soundtrack is also beautiful and fits the film well. I liked the low-key approach the film took, using body language and gestures to get across temptation. Some of it was predictable but I think the film worked in the end. Yes, I think this approach was needed here because the film was all about unmasking hidden thoughts. For example, there is a scene where Joanna sits on a sofa with Alex in a hotel bar and the camera is briefly on her hands. An interesting take. Yes I liked how tiny little nuances spoke big volumes about what everyone was trying to hide. Thanks for checking my review of it.